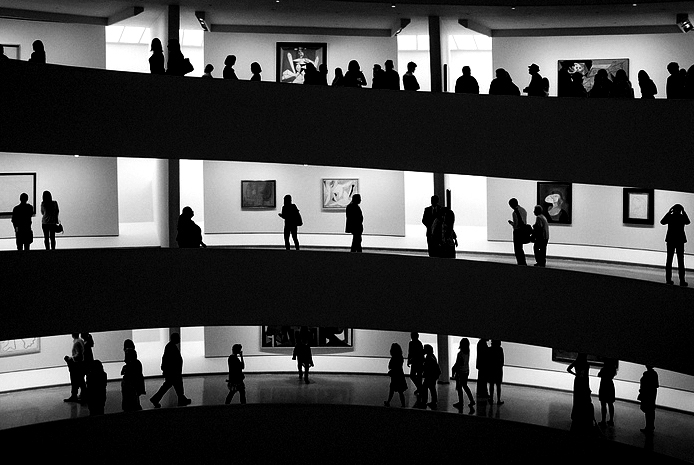 Walking into The Guggenheim museum is magical. Powerful. Moving. Like stepping into a modern temple of the spirit, it’s an architectural tour de force. Immediately upon entering, the eye is drawn up, up, to the towering geometric glass ceiling, allowing one to imagine what it would be like to suddenly peer inside the ordered shell of a humble hermit crab or that great, mysterious mollusk of the deep, the Nautilus. Until January 23rd “The Gugg” will be exhibiting a collection of works by the world famous master of perspective, pioneer of cubism and all around womanizer Pablo Picasso. Specifically, this well curated show1focuses solely on Picasso’s black and white works which, considering the venue in which it appears, makes for a truly unique and interesting museum experience. For those of you who have not had the pleasure of visiting The Guggenheim 2, its interior is an architectural exercise in a world without color. Decorated entirely in white–from floor to wall and stairwell to ceiling–there’s nary an intrusion of color about3. This facet is no more evident than in the museums soaring main room, with its iconic open-aired circular ramp way. Add to this purposeful architectural whiteout a collection of Picasso’s black and white paintings, sculptures and drawings, and one is treated to a uniquely duotone experience. It’s as if someone had suddenly waved a wand and altered ones perception of the world, pulling a sort of reverse Wizard of Oz. But instead of being transported from the grayscale existence of depression-era Kansas to the colorful, vibrant world of Oz, one’s experience is quite the opposite. The vivid colors of our modern Oz, Manhattan, are checked with ones coat at the door and we are rapidly conveyed into the gray, colorless world of Picasso. Now a distinction must be made here, for I feel that all this talk of a lack of color could be misleading to those of you who thrive in the fast-paced RGB4 colors of modern existence. For you see, black and white are colors to Picasso. These stalwarts of the visible spectrum, and the grayscale in-between, were a theme that spanned his entire career, allowing him to obsessively explore structure, line and form in his various arts. And when he did use color, however, he was brash and abrasive with it, throwing his indigo’s and violets, reds and ochre’s around in a way that allowed him to channel his more animalistic being. But throughout all his forays into the color spectrum, he never put black and white away, never shied away from their power and message throughout his entire artistic career. 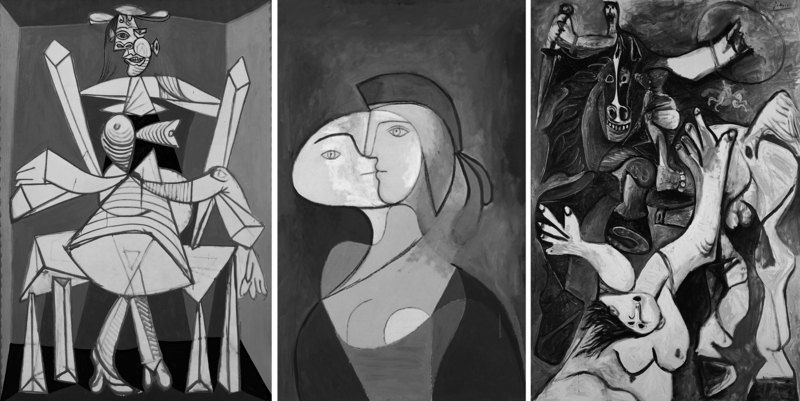 Picasso’s Black and White exhibition at The Guggenheim offers a once in a lifetime chance to take in 118 black and white paintings, sculptures and drawings, many on view for the first time5. This is a show that should not be missed and has the potential to appeal to a wide audience, from the rookie Picasso admirer just getting into art appreciation to the most passionate and ardent of fans. 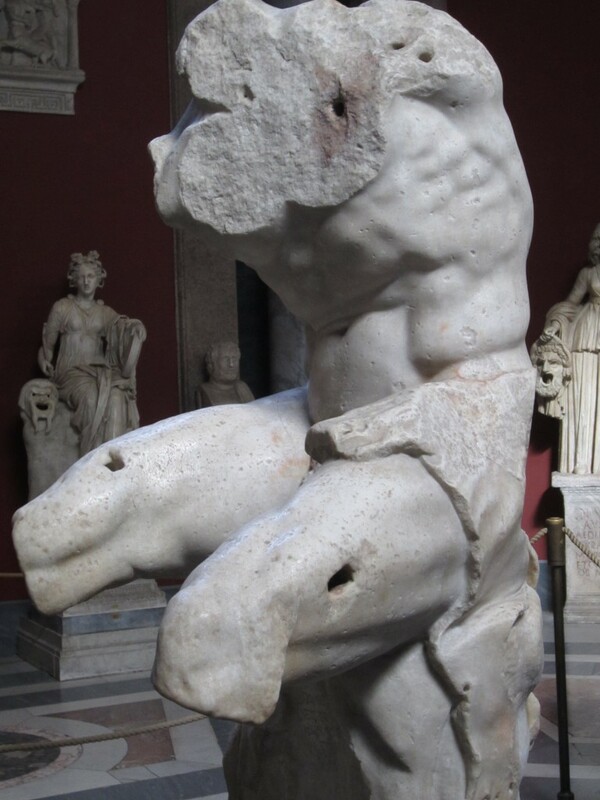 The show runs through late January of 2013 and features some truly remarkable works.